Over the last few weeks I have had many people ask me if they are allowed to use the Research Center Library here at the Georgia O’Keeffe Museum, as members of the general public. The short answer is YES! 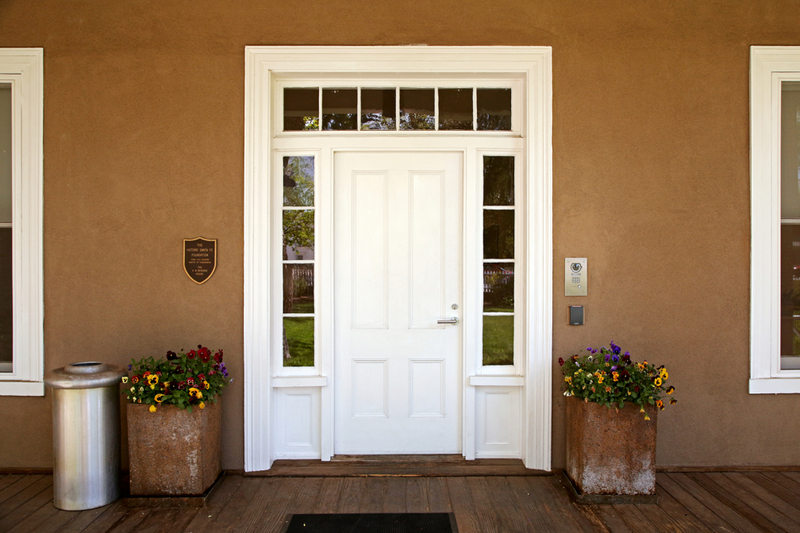 The Research Center is located at 135 Grant St. in downtown Santa Fe, just around the corner from the Museum building. Most people recognize it as a lovely two story adobe building, with a great plot of green grass, beautiful gardens in the spring and summer, and a white picket fence. Currently anyone from the public is welcome to come use our materials, look at materials from our collections, and utilize the resources that we have here. Great question! The library holds library and archival collections relating to Georgia O’Keeffe and her contemporaries, American Modernism, and related regional histories. Among the Georgia O’Keeffe Museum’s most unique library and archive collections are Georgia O’Keeffe’s personal property including the libraries from her homes in Ghost Ranch and Abiquiu. Additionally we have access to many research databases and current art related periodicals. The Research Center is open by advanced appointment Monday – Friday between 9am – Noon. Appointments can be made using the appointment form. We kindly ask that you consult our policies and procedures before filling out the appointment form, which are located on the website here. Please contact the library staff for more information about the collections, available resources, and scheduling an appointment via email: library@okeeffemuseum.org or by calling 505-946-1068. We look forward to seeing interested members of the community in the Research Center!